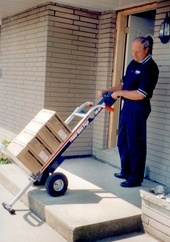 The PowerMate POGO P-1 is a light duty motorized hand truck most often used to aid with small parcel deliveries. The P-1 is the smallest stair climber at just 20" wide. This lightweight machine is actually a regular hand truck with a light duty PowerMate POGO assembly attached. This makes the POGO P-1 our lightest stair climber at just 40 lbs! (18 kg). The P-1 has a max. 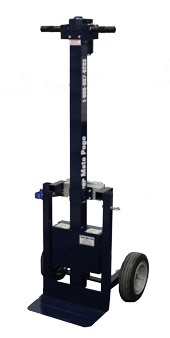 lifting capacity of 220 lbs., sufficient for most residential or light commercial delivery applications. 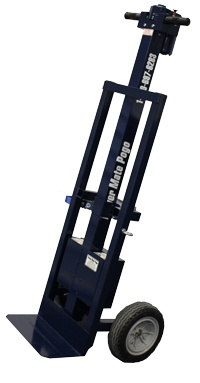 The hand truck component can be used like a regular hand truck, but when needed the PowerMate POGO assembly quickly attaches to the hand truck to provide a power lift feature for loading or unloading trucks and vans or negotiating curbs and thresholds. The POGO P-1 can climb stairs, however the pneumatic tires are best suited for outdoor use. The POGO is used by delivery companies such as office supply houses, beer distributors, couriers, home care oxygen providers, etc., to deliver such things as boxes of paper, cases of floor tiles, salt for water conditioners, coins and parcels, etc. The POGO P-1 comes standard with pneumatic wheels for rough terrain. Size: The P-1 is the lightest and narrowest in its class. Detachable PowerMate POGO assembly provides added flexibility for smaller loads. Pneumatic tires are ideal for outdoor applications. 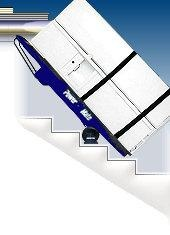 The P-1 has the same lifting height at 40" as our full-sized stair climbers! Contributes to jobsite safety by reducing jobsite injuries and injury claims. For more information on Safety and Profitability go HERE. The POGO P-1 comes standard with pneumatic tires for rough terrain. The PowerMate POGO assembly attaches to the hand truck when needed to power heavy loads up and down stairs or on and off trucks. This provides for the option of powered or unpowered assistance. PowerMate POGO P-1 comes equipped with battery pack and battery charger. 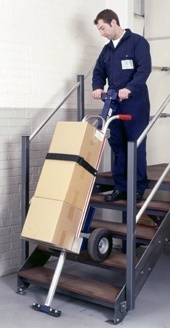 20" x 21" x 55"
is our smallest profile stair climber - ideal for small package delivery. 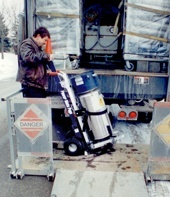 PowerMate POGO P-1 on delivery. 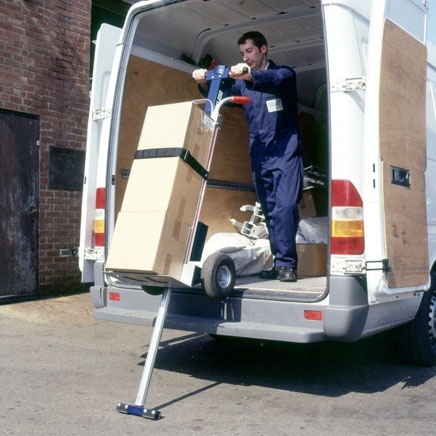 The POGO P-1 provides delivery firms added flexibility in staffing choices as the ability to lift heavy objects is now less of a concern. The PowerMate POGO P-1 has a bottom rubber guard on the foot to protect customers' property. 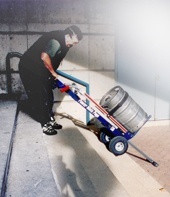 PowerMate POGO's are ideal for moving beer kegs. POGO is ideal for the HME market with the right weight capacity, small profile and flexibility.